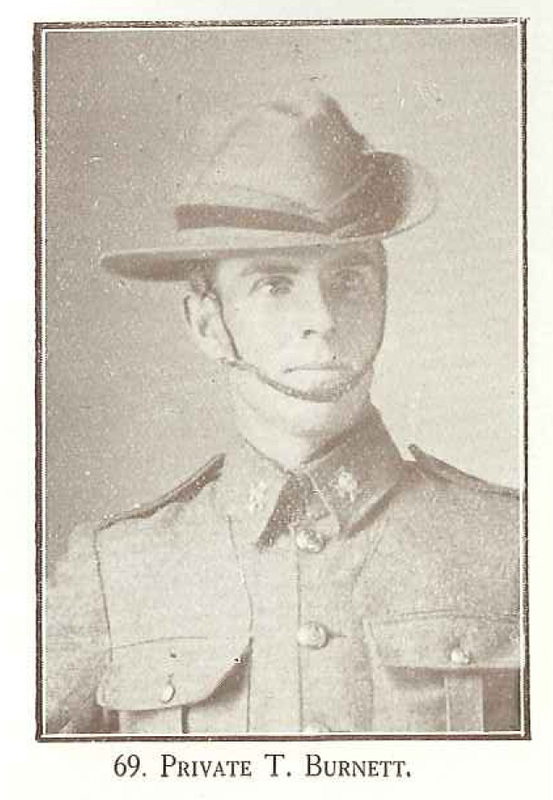 "Great gloom has ben catover the Fairlie District at the news of the death of Private T H Burnett (Canterbury Infantry battalion) who was killed in action at the dardanelles. Private Burnett, during his many years residing in Fairlie, endured himself to practically the whole population by his unserving straightfordness and genial nature. (says the Timaru Herald), and was always the true type of one of nature's very gallant gentlemen. he took a great interest in sport, being keen golfer, as well as one of the finest footballer ever seen in the Mackenzie country. The Fairlie correspondent of the Timaru Herald writes we can account for the error in his name as follows. When Mr Burnett passed his medical test the Doctor spelt his name barnett, although pressed to do so, did not think the matter sufficient importance to have the mistake removed. We have always addressed his papers etc to 6-411, so there can be no mistake that it is really T. H. Burnett who was killed." Otago daily Times 1 June 1915 p10.